Cooking for a crowd doesn’t mean you can double up on quantities and expect instant success. There are also extra considerations if you are preparing low-calorie food. However, follow some basic guidelines and your efforts in the kitchen are bound to be a success. Keep things simple, the main principle to bear in mind is that the more you cater for, the simpler your menu should be. Choose food which is easy to prepare, cook and serve. Ideally, it should be something that can be prepared ahead of time and cooked or reheated with minimal attention when required. Make sure you plan ahead and stick to a comprehensive list of ingredients you require. Before starting, ensure you have the correct equipment for the job. You will need larger saucepans, appropriate serving arrangements and space in your fridge to store the finished dishes or large quantities of ingredients. Soup is easy to make, reheat and serve, so it makes an excellent choice for large-scale cooking. Choose a variety that doesn’t depend on cream for its good taste, a vegetable based broth would be the perfect option. Salads are an excellent choice. The main ingredients can be prepared well ahead of time and assembled just as you need them. Start planning your salad by choosing a bed of leaves as your base. For extra simplicity, buy prepared salad mixes. Create a low calorie dressing for your guests to drizzle over. Make sure you only offer the dressing at the table. This allows guests to have more control over their calorie intake. Crudités are a great choice. Prepare a platter of chopped vegetables such as carrot, celery, pepper and cucumber served alongside low calorie dips like a spicy tomato salsa or low-fat yoghurt based dressings. Cook meals with minimal fat and oil, use low-fat spray wherever possible. Choose lean cuts of meat. Consider using lower fat meat like turkey or venison in casseroles and sauces. Instead of rich, cream laden gravies, try basing your sauce on tomato. Wherever possible, think about getting guests to serve themselves, buffet-style. This gives them better control over their portion sizes. Ensure there are plenty of good vegetable options available which will allow guests to bulk-out their meal without adding to the calorie count. Don’t spoil your good work with a calorific blow-out at the end the meal. Keep the main part of the dessert low in calories and if any of your guests aren’t watching their intake, they can always add little extras like cream or custard if they are served separately. A delicious mixed-fruit salad. Instead of serving it swimming in syrup, prepare the fruit and serve in a large bowl, with apple juice as the base for the salad. You still have to be careful with the sugar content of fruit juice but at least it isn’t packed with the empty calories of sugar. Serve individual fruit tarts by greasing muffin tins and shaping low-fat filo pastry into little tartlets. Fill with chopped apple or fruit of your choice and bake until golden brown. Baked apples always seem to go down well. Core each apple and fill with dried fruit. Make sure you score the skin so the apple holds its shape during baking. Drizzle each apple with a little honey and bake until tender. This should take no longer than an hour in a medium-hot oven. Serve with low-fat crème fraiche. Cooking low calorie food for crowds needn’t be an intimidating prospect. Choose simple but tasty dishes which can be prepared ahead and kept warm if necessary. 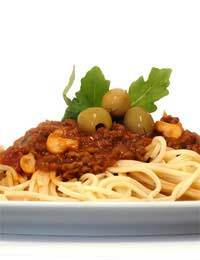 It is quite possible to cater for lots of diners, with lots of taste and fewer calories.